Ever wondered what a bat looks like under a microscope? Me neither. Here's one anyway. This photo won the Visions of Science and Technology Photographic Awards in 2007. It's actually groundbreaking, and has given bat-o-philes (chiropterophiles?) a good glimpse of this living bat's face. Are we sure they aren't flying rodents? This looks an awful like a guinea pig. An evil guinea pig at least. 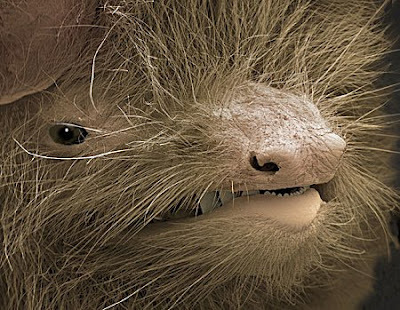 Seriously, isn't that one of the critters from The Dark Crystal? ha! i was just thinking it belongs in Labyrinth. Definitely, the Jim Henson studio should be so inspired by this guy.